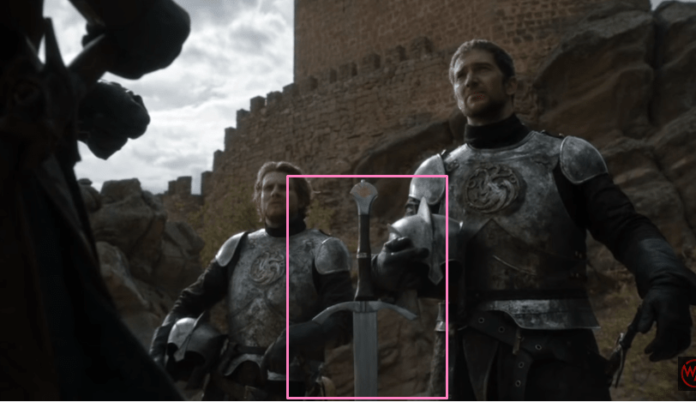 Game Of Thrones Season 7 Spoilers: Valyrian steel which is believed to be the most efficient weapon in the Kingdom of Game of Thrones appears to have an in-house competitor. This sword is even stronger than Lord Eddard Stark’s Valyrian steel. Possibly the sword currently lies in the iron throne itself. In the Game Of Thrones S6 Episode 3, The Tower of Joy Flashback in memory of Bran Stark who was with the grandmaster to see his family history. There was a close fight between Arthur Dayne and Eddard Stark where Arthur almost killed him. The sword appears to much more better than of any possibly known thing. Samwell is continuing his research on the ways to fight the north. Cold winds are going to flow in the south leaving all the towers and kingdom destroyed in the snow. Night King is unstoppable after the discoveries that he could be the one riding Ice Dragon or Ice Bear in GoT Season 7 Spoilers. For now, the protectors of the wall have no other alternative to fighting the immense power. By the end of Season 6, we have seen different fights in GoT which includes some deadly wars among the kingdoms. The end arrives with a little idea that upcoming episodes of GOT Season 7 are definitely going to be much more bigger than the expected. The season is most possibly going to be about the merger of kingdoms and war preparations for the joint interest against the north. Coming back to the topic, Sword of Arthur Dayne is the Better Sword Than Valyrian steel. After fight and backstabbing of the most viable and skilled fighter in the whole kingdom, Eddard didn’t spare a chance to leave sword of Arthur lying with his body. He took the unbeatable thing along with him all the way upstairs to meet his sister Lyanna Stark. We all know that there is only one person in series continuing dynasty of Dragon Blood Rhaegar Targaryen, who is Jon Snow himself. It also gives him leverage of not getting killed by any type of fire. We are not claiming it’s a perfect spoiler of Game Of Thrones Season 7, but possibly a fan spoiler you can say. Jon Snow will need the sword of Arthur Dayne to fight the Night King. Previous articleLegion Chapter 3 Spoilers, Promo & Air Date: Can David Haller Be Saved?